UK- A group of approximately 15 people will deliver letters of support from many organisations to the Swiss Embassy in London. Austria- Vienna, 10 am. Peaceful demonstration with banners in front of the embassy will present letter signed by Greenpeace and Friends of the Earth. Barcelona- A performance and noise demo will take place outside the Swiss Embassy in Barcelona. Madrid- A group of approximately 15 people will deliver letters of support to the Swiss Embassy. Amsterdam- A samba band will lead a group to deliver support letters to the Swiss embassy. Berlin- A concentration in solidarity with the case of Aubonne and Genoa will take place today. Amnesty International, have expressed their concerna dnare following this and other Swiss cases with their own researchers. 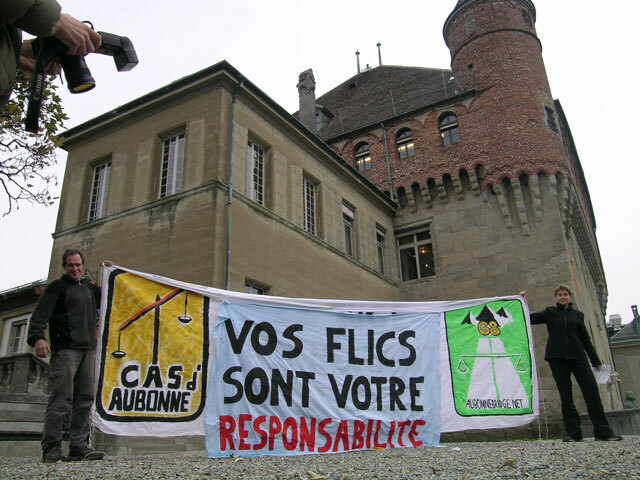 Eight Members of the European Parliament from various countries have comunicated to us that they will today be faxing theSwiss authorities to show them their cocern about the case and the development of the legal proccess. They will be represented at the trial on Monday David Hammerstein MEP, Spain. Noam Chomsky has signed a statement asking for calling "the attention of authorities to these very severe charges and urging them to deal with them expeditiously and justly." Susan George, author of "Another World is Possible" and ex president of ATTAC gives her feel support and expressed her deep concern about the issue. Ignacio Ramonet, Director of Le Monde Diplomatique gives his full support to the campaign. London- "Liberty"- Defending -human-rights organisation. *will attend the hearing on Monday 28th. And a long list of NGOs and diferent civil society groups from Catalunya. More than 30 Human Rights organisations & Non Govermental Organiations and Neighbourhood Associations have also sent faxes of support to the Swiss Government. The case has gained international of different lawyers groups the local and international level will be monitorin the process. Several members of the group working group from this Comitte will be present on the hearing on Monday 28th.